Advent Begins: Saints and Scripture Sundays - The Kennedy Adventures! What better way to start off Advent than with a reminder that there’s no time like the present? So many times, we put off striving toward becoming the person God intends, thinking, “I’ll take care of it tomorrow.” This morning’s Gospel reading stresses how foolish procrastinating can be. Looking for more inspiration for beating your procrastination habits? I’ve been listening to Father Roderick while learning how to run, and although his series was created for Lent, it works for Advent as well. What are your plans for this Advent season? During this 27 day period, I’m hoping to become healthier – both physically and spiritually. Some of my favorite Feast Days are during this time frame (St Nicholas, the Immaculate Conception, and Our Lady of Guadelupe), and I’m planning on reading and learning more about these feasts. Looking to read ahead for our upcoming liturgies? You can find the readings for the First Sunday in Advent , as well as the weeks to come. 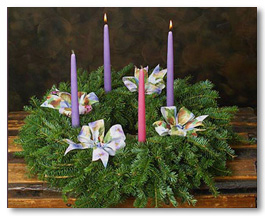 Need an Advent wreath? (like me — since I’ve procrastinated and haven’t picked one up!) How about an Advent wreath craft with your children? It’s time to gather all your Nativity Pieces, and start telling your children the story. Be sure and leave a comment, to let me know how your week will shape up, and what your plans are for this season of preparation. I’ve been looking for a good nativity set for several years now and have not found the perfect one yet. There either not in stores, super cheap, or several hundred dollars. I’m hoping maybe this year will be the year? My girls will be excited when they get home from school to see our advent calendar (they take turns marking off each day).